"Once upon a time, a people of great artistry and great knowledge ruled the planet Mekalion: the Kamille. For a thousand years, they prospered peacefully. Servants they called the Kamelion." Three releases and four stories in, the latest trilogy from Big Finish ends here with The Kamelion Empire by Jonathan Morris. The play answers questions about just who Kamelion was, explains why no-one mentioned him after The King's Demons on-screen, throws in casual references to The Sensorites and less casual ones to The Invasion Of Time, and takes us straight up to the redecoration of the TARDIS in The Five Doctors. All this with a cast of only five actors. It's a lot to pack in, which only makes it sadder that this play is curiously lacking. In fact, at times it's almost a bit dull. I think it was when a cast of Kamelion robots deliver exposition in the form of a Jackanory-style tale that I found myself wondering when something big was going to happen. There are primitive grunts who want to overthrow the Kamelion robots, rival factions of a parliament of sorts vying for control of the titular Kamelion Empire, trips into a dreamlike realm, and a lot of backstory, but despite all this it feels like very little really happens. You could trim an episode off and retain the meat and bones of the story. It doesn't help that The Kamelion Empire feels isolated from the rest of the trilogy. Tegan has defaulted to disliking Kamelion again, for example, despite the opening play in this trilogy of releases (Devil In The Mist) being entirely about her coming to an understanding with him. Turlough seems to veer between his feelings on Kamelion depending on the scene. There's also some especially clunky writing where Tegan recalls some family history, by a battlefield, despite Kamelion continually interrupting her and warning her to stop. It all feels rather slapdash. The fact the regular TARDIS crew cast sound utterly unenthused in the play's extras only adds fuel to the fire. Its biggest failing though is with Kamelion himself. It'll surprise no-one who has heard the other stories in this trilogy, but the play deals yet again with Kamelion being possessed and fighting for some sort of control with an antagonist. That makes all four stories in a row to have this as a central theme. In the end, I think it's this more than anything else which turned me off. Why should I care when the plays have covered this ground before? Worse still, Morris has to actively change bits of Kamelion's backstory to try and do something new. It shows a proper problem with the character and, once again, its limitations. The opening story in this trilogy got a carbon copy with its themes regarding Kamelion in the second story. This was followed by a lovely play about 1980s television, but one where you could remove Kamelion entirely and not really change a thing. This final story tries to alter what we do know of the character from his on-screen appearances, but winds up retreading old ground. There have been good things about this trilogy. Black Thursday / Power Game was a lot of fun. Jon Culshaw was fantastic. The CD cover for this play is lovely and the music apes the 1980s soundtracks well. I've little else to really cheer about though. In the end, this trilogy is more of an argument in favour of the character being dropped than one in favour of more outings. 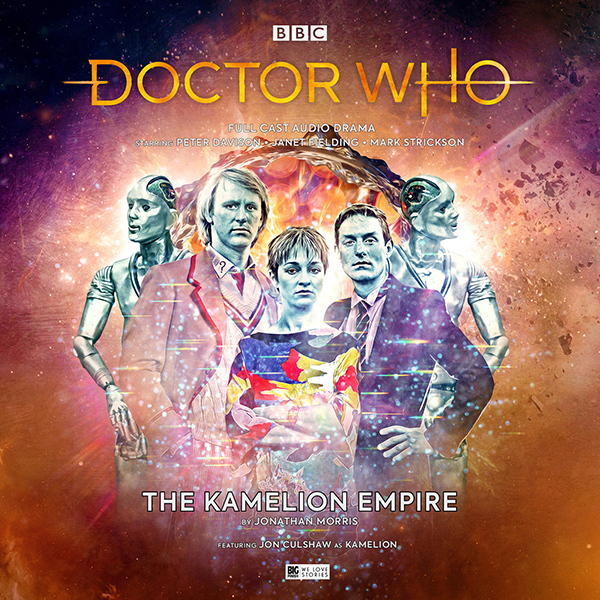 + The Kamelion Empire is OUT NOW, priced £14.99 (CD) / £12.99 (Download).